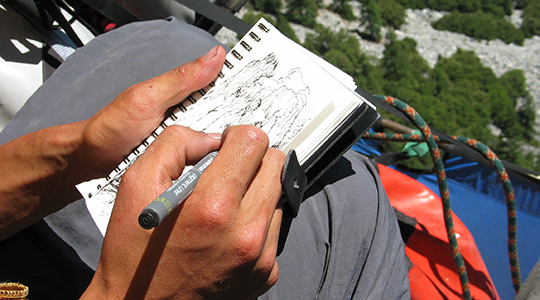 Climber, artist and Alpinist contributing illustrator Mike Dewey spent the mid- to late 1990s living and working seasonally in Yosemite Valley and the Sierra High Country. During these years, in addition to climbing boulders, routes and big walls, he sketched and painted scenes of friends and scenery in his notepad. He also studied computer programming at Harvard University. Today, Dewey lives in Oakland, California, with his wife Maggie and their two children Bodhi and Lupin, making a living as an engineer at a huge online social network for art called DeviantArt. Dewey's work has appeared in Alpinist 40, 46, 48, and he has a piece in the works for an upcoming issue. He continues to climb rocks and expand his art, combining paint programs he's helped build with acrylics. He works with a variety of contemporary styles including impressionism and street art. He also carves stone sculptures. In the following pages Dewey walks us through some of his work.